Diarrhoea is the frequent and copious passing of abnormally watery stools (faeces). Travellers' diarrhoea is diarrhoea that occurs when you travel abroad. While diarrhoea is the main symptom, other symptoms include stomach pain, bloating, nausea, and fever. Most often, symptoms are mild and disappear after two to four days. However, they can be severe and persist for longer, particularly in children, older people and people with other health issues. Can I get treatment now? 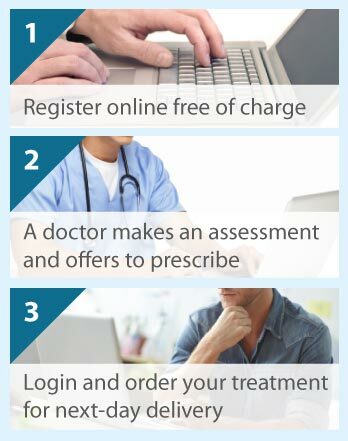 If you are going overseas then The Online Clinic can prescribe antibiotics to take with you as a precaution. Just click on the Free Online Assessment button to start. We can arrange next day delivery of your medication. How common is travellers' diarrhoea? Travellers' diarrhoea occurs in 20% to 60% of people who travel to areas of higher risk. It most commonly affects people travelling from well-developed countries, such as North/West Europe and the USA, to less-well developed countries, such as parts of Africa, Central/South America, and Asia, where the hygiene and sanitation standards are poorer. Traveller's diarrhoea is caused by bacteria (e.g. Escherichia coli, Campylobacter, Salmonella, and Shigella), viruses (e.g. norovirus and rotavirus), and protozoa (e.g. Entamoeba, Giardia and Cryptosporidium) in contaminated food and drinking water. However, the cause is not always identifiable in a stool sample. How is travellers' diarrhoea treated? Traveller's diarrhoea does not usually require specific treatment but it is vital that you drink lots of fluids, especially water, to avoid dehydration. Rehydration powders, such as Dioralyte or Electrolade, which are added to water and provide water, salts, and sugar, can also be used for those more at risk of problems (i.e. young children, older people and those with health problems). To treat the symptoms, the antidiarrhoeal medicines loperamide or Pepto-Bismol are effective in quickly stopping the diarrhoea and stomach pains but should not be used regularly. While not usually needed, a short course of antibiotics may be required to treat moderate to severe travellers' diarrhoea caused by bacteria. Generally, ciprofloxacin is given to people travelling to Africa and Central/South America, and azithromycin is preferred for those visiting South/Southeast Asia. Small meals of plain foods, such as bread, rice, potatoes, cereals and soup, are recommended. Dairy products, fatty and spicy foods are best avoided. When should a doctor be contacted? It is not usually necessary to contact a doctor regarding travellers' diarrhoea because the infection generally clears up after a few days. However, you should seek medical attention if you or the affected person has blood in the stools, a fever, is dehydrated or cannot drink sufficient fluids to keep hydrated, has diarrhoea that continues for more than 3 or 4 days, or does not respond to antibiotics. How can I reduce the risk of travellers' diarrhoea? The chances of getting travellers' diarrhoea may be minimised by taking special care of what you eat and drink. Wash your hands thoroughly before handling and eating food. Ensure all food is fresh, cooked thoroughly and served very hot (high temperatures kill most germs). Eat only foods prepared in a clean, reputable establishment - not from food stalls. Peel fruits and vegetables. Avoid salads, raw sea food, raw eggs (mayonnaise), unrefrigerated buffets, and food left standing at room temperature. Also avoid unpasteurised milk, ice, and ice cream from street vendors. Drink only bottled water (from sealed bottles), boiled water or water that has been filtered and disinfected; avoid local tap or drinking water.